Children learn as they play. 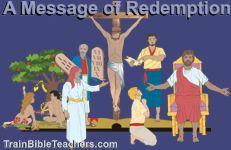 Teachers can incorporate play into the Bible lesson in ways that increase learning. However, they must learn to use play effectively so it does not simply become a time filler. More to Read: Play as a Bible Teaching Method? On this handout, teachers will acquire tips on how to choose dramatic play activities for their lesson and what to remember when using it. Since children learn through playing, Bible teachers can increase learning by strategically incorporating play into lessons. In this five page teacher training worksheet, teachers will work through six tips for using play in ways that are purposeful and more than just time fillers.